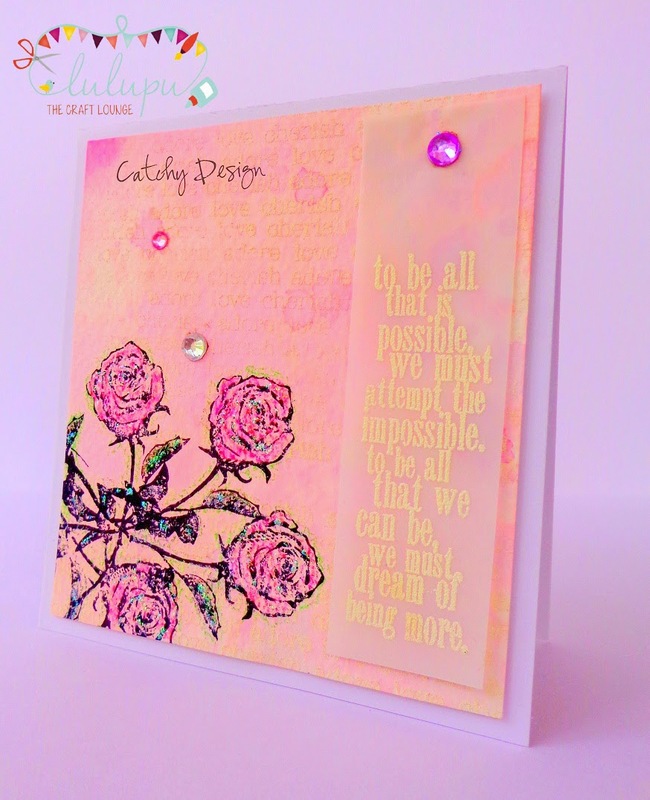 Hope you all are enjoying the fun challenge -Background Stamps+Mists hosted by our very talented DT Kripa this fortnight. 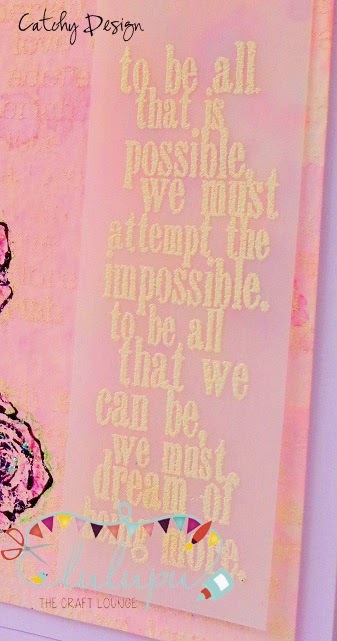 Here is my mixed media card for you as inspiration. 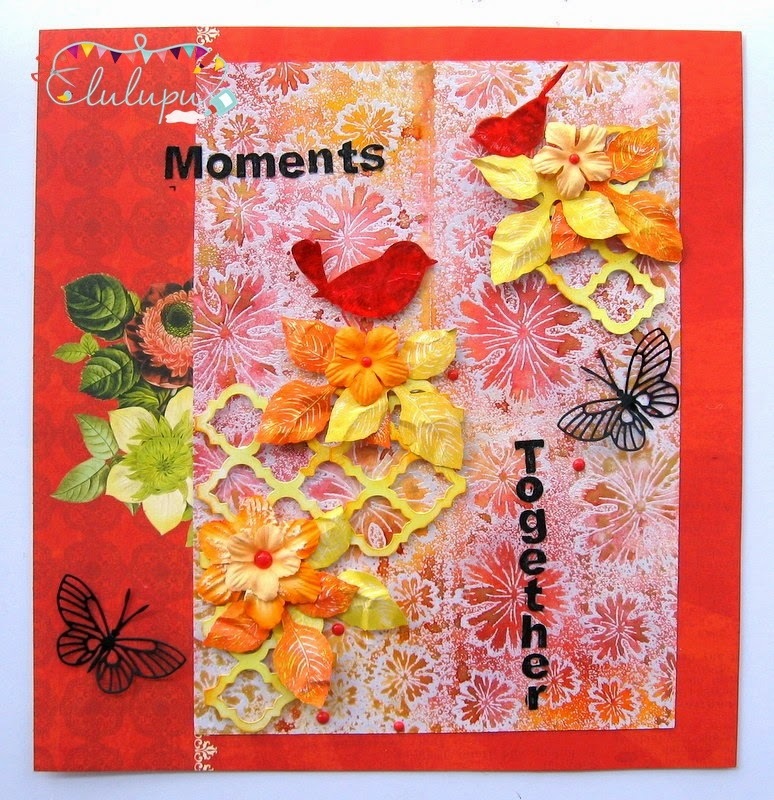 I used my background stamp to create the illusion of a garden with butterflies and vines and used my mists to colour the entire scene. For this card, I first chose the base on which I had to start building up my design. I decided to go with a semi gloss chipboard. This was none other than the packaging I had saved from my Martha Stewart scoreboard. Sea Grass green, Sea mint green and Tweedle Dee Denim Flat Fabio. 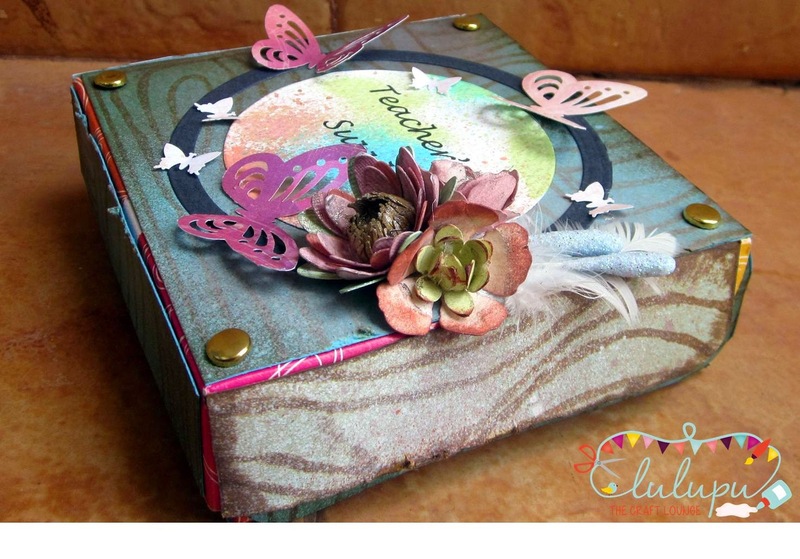 I then stamped my Justrite Background Stamp- Butterfly and Vines in Black Archival Ink. I lifted off some ink from the image from the top portion before it could dry. Again a coat of Lindy's sprays lighten the stamping further.Then heat dried all of this. 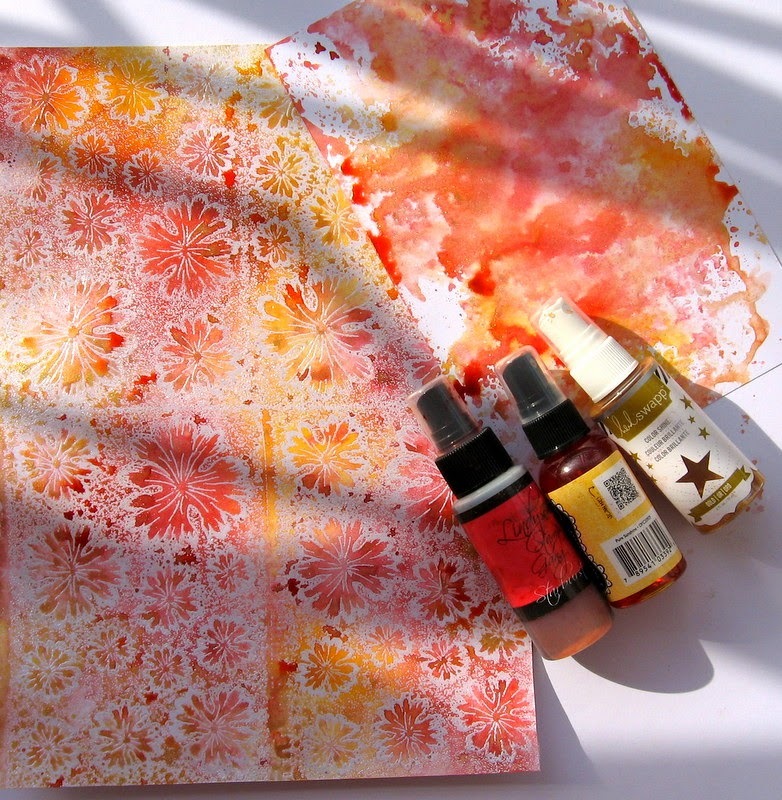 Now I started with my stencils from Magenta and used some texture paste mixed with Lindy's Stamp gang spray- Cape Cod Coral and made the flowers. The butterflies are also from the same stencil with I made using some texture paste in black and later coated them with glossy accents and some glitter. 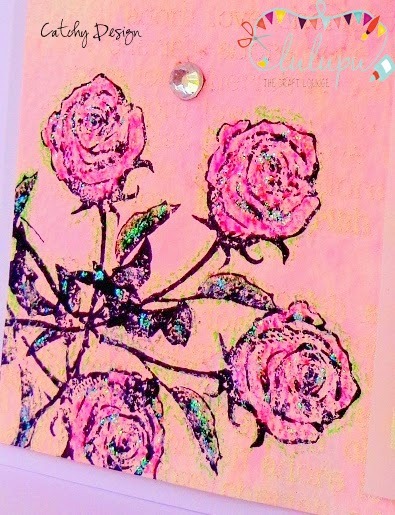 I also used the Prima- Bubbles stencil to make the bubbles. Outlined them with charcoal pencil and filled in with some white and light blue Oil pastels. 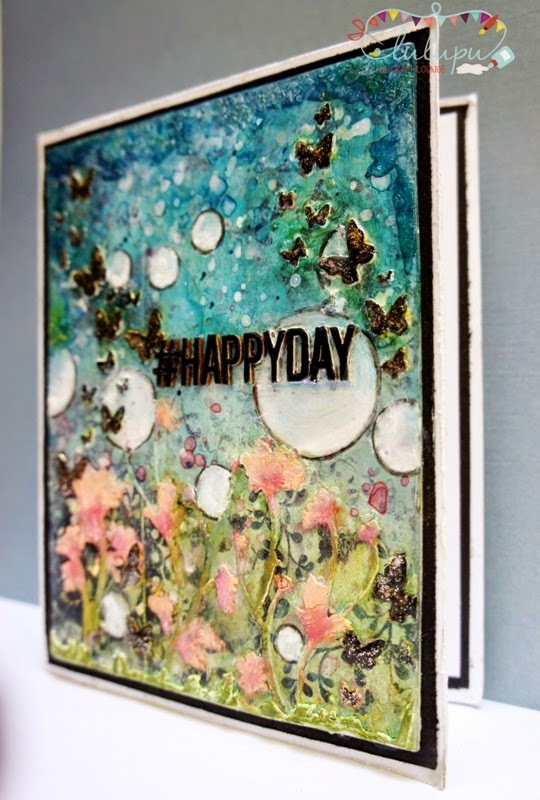 I also distressed the edges of the card with Prima comfort craft tool. Lastly made a Hashtag sentiment- Happy days with Studio Calico wood veneer-Alphabets and coated it with black paint and glossy accents. Hope you liked the card and were inspired enough to participate. Only a couple of days left to get in your entry into this challenge. So don't forget to enter your creations here. Kripa here with our Special Guest of the month. 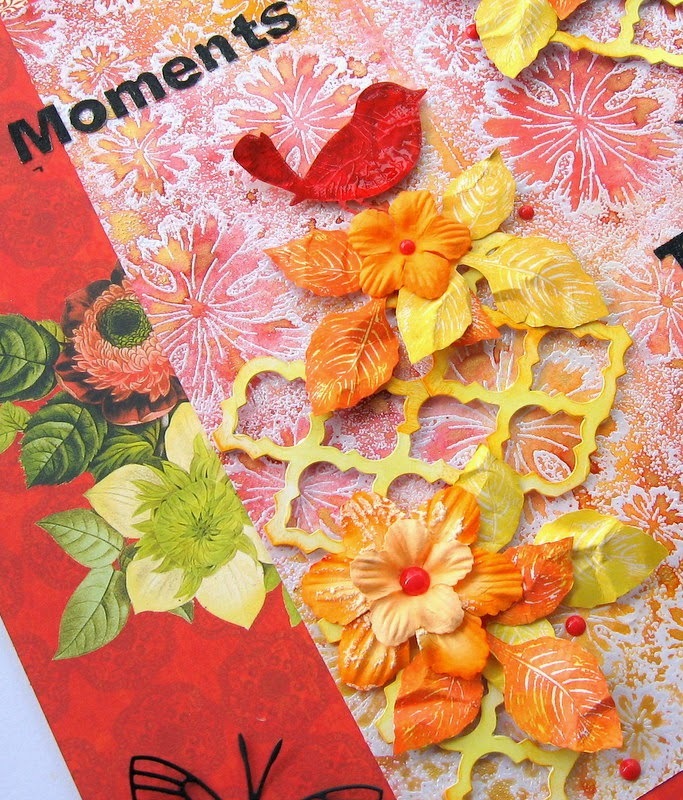 She is a regular participant in our challenges and has tried her hand at many forms of art. Over to Snehal Watwe Welde to tell us a little more about herself and also share a tutorial. 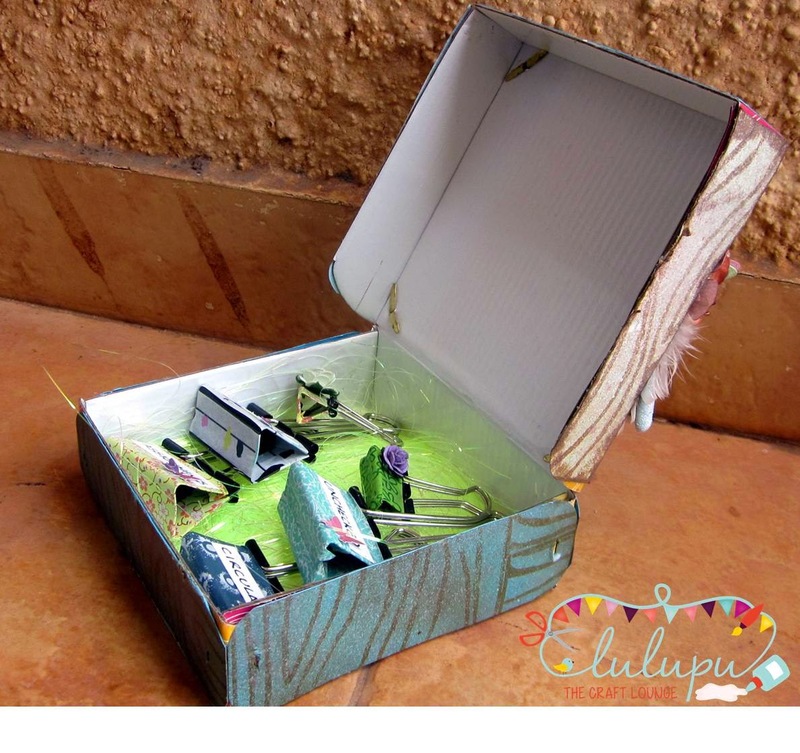 My project is a gift for my daughter’s teacher - I have recycled an old Mithai box to hold some essential supplies for her. I will try through pictures to give a step by step procedure of making the box. First I took a Teal card stock and stamped it with wood grain stamp, distressed it and used mists on it. Then measured the box and cut the paper into strips to glue on the top and sides of the box. Rest is simple - embellish the top of the box. 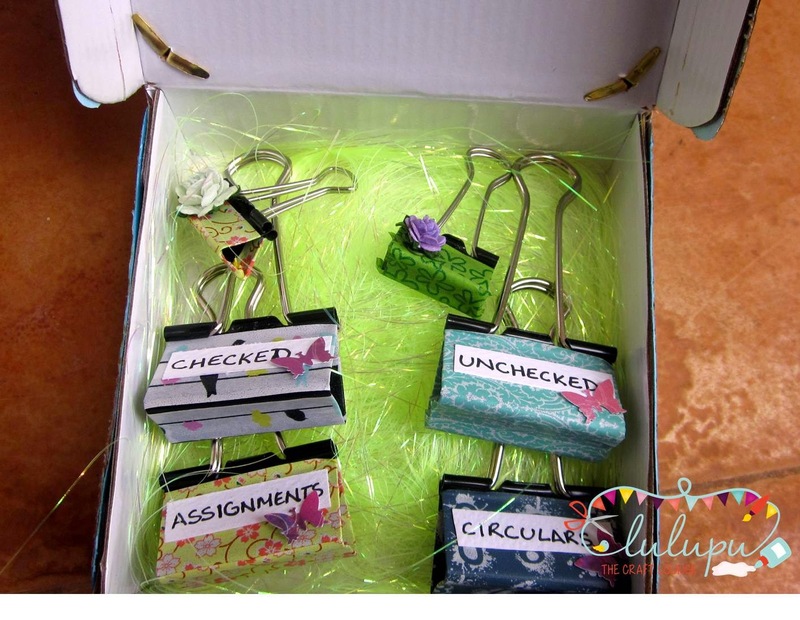 I've altered some clips for the teacher to organize her stuff. Hope I inspire you to create something for this challenge. What a clever up cycling idea! 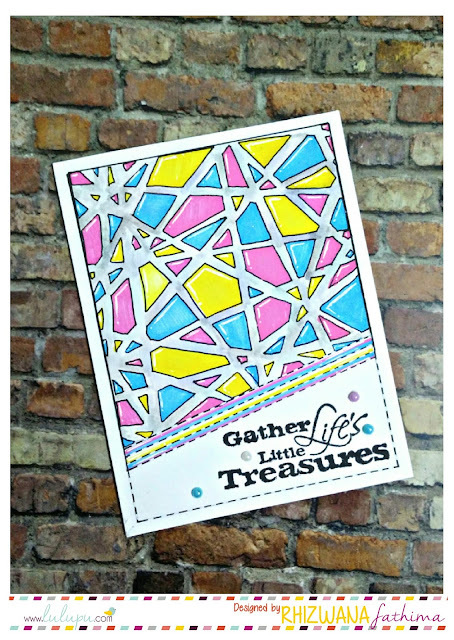 So, friends, have you linked up your project yet to Challenge #37 - all you have to do is use background stamps + mists (Read more here) and you could be in the running to win Rs.500/- voucher! I first heat-embossed my background using Ranger Super Fine Gold Embossing powder and used Distress inks - Scattered Straw, Antique Linen, Black Soot and a little bit of Peacock Feathers to create my background. Then, I misted my background using the new Hedi Swapp Color Shine mists from the Lulupu store. These mists are really beautiful colours and when you spray them, they give this added shine which when you see in real life, is really beautiful. 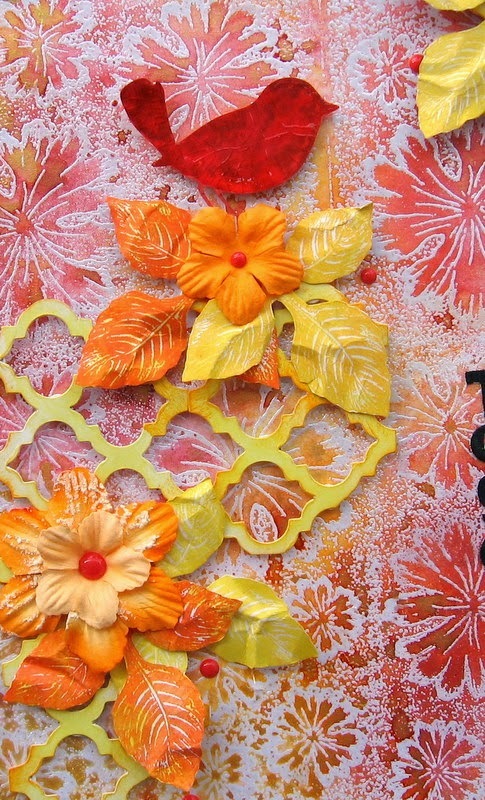 I have used Tropicana Teal, Coral and Gold on my card. The small peach coloured flowers and the ribbon have been coloured using the Coral mist and the die-cut word 'Thanks' was sprayed with Tropicana Teal Mist and distressed around the edges with Black Soot. I have used the Gold mist to just fleck around the entire background. If you look closely, you will see it gives a gorgeous shine and I am using it almost on all my recent projects. The leaves were sprayed with Lindy's Stamp Gang Curiouser Chartreuse Flat Fabio mist. I love the intensity of it's colour ! Challenge #37 Background stamp + Home made Ink Sprays..
Hello dear friends, This is Deepti , hope you are enjoying the current challenge here at Lulupu hosted by our lovely Kripa and today is my turn to inspire you with a sweet and simple card. Please find the rules and guide lines here.. 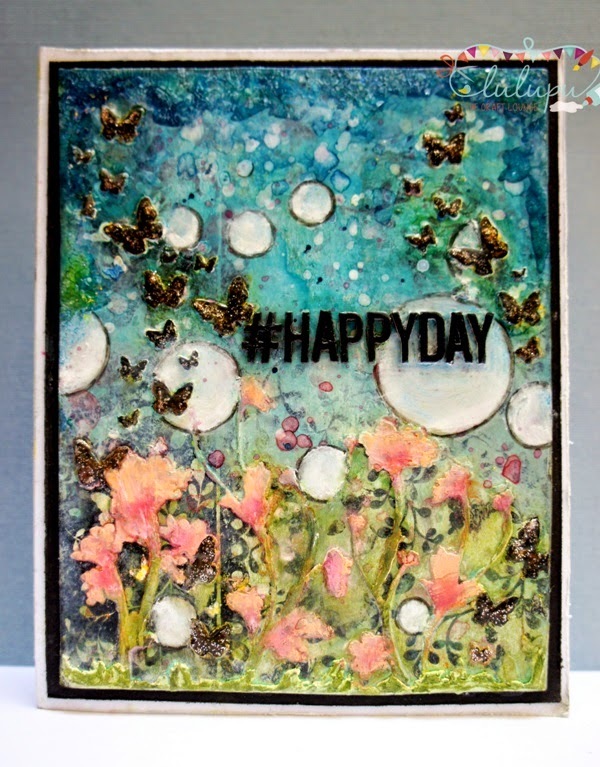 I took a water color paper and stamped with Kaisercraft-love cherish adore back ground stamp in Versamark ink and heat set it with Seafoam white embossing powder. Background Stamps + Mists/Ink Sprays..
Today,I've small tutorial , how can we use background stamps with inks for making projects. I used Heartfelt Creation Vintage Morning floral background stamp and Micia watermark pad to make impression four times on white paper. 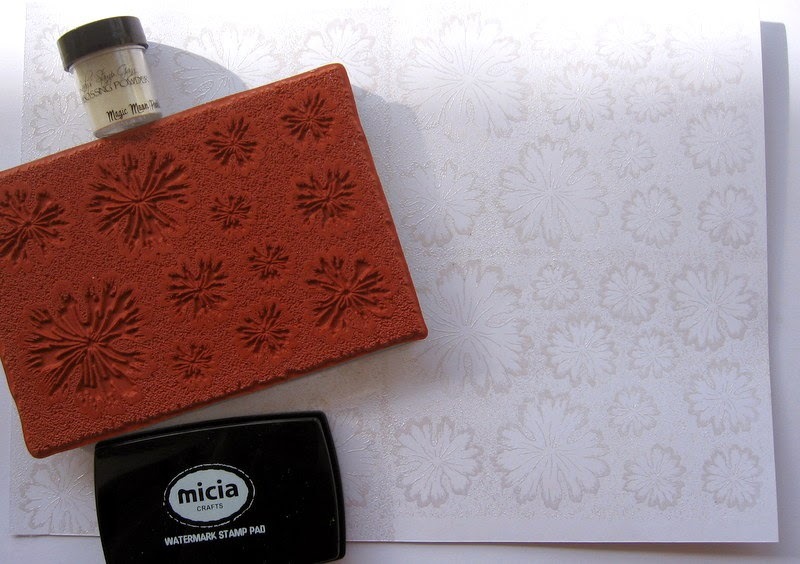 I dusted Lindy's stamp gang white pearl embossing powder on it and heat embossed with my Ranger Heat Tool. I spritzed Lindys stamp gang Poinsettia Red Gold, Dylusions Pure sun shine and Heidi Swapp Colorshine Gold. And lifted extra color with another paper. 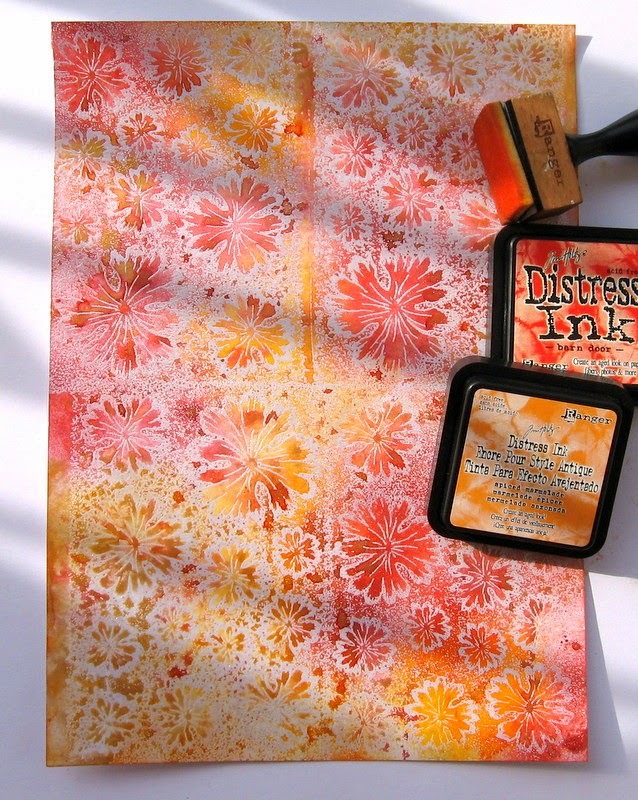 Distressed the edges with Ripe persimmon and Barn door distress inks. And its ready to take the embellishments. I diecut the frame with Sizzix Frameworks Die- trellis, colored it with distress inks. Flowers are from Prima Orange Assorted collection. I stamped leaves with Heartfelt Bold Leaf cling stamp and Staz on Pumpkin ink and fuzzy cut it. For a bird, I used Memory box Die, coloerd it and also applied Ranger crackle accents, you can see crackled texture on Birdie!! 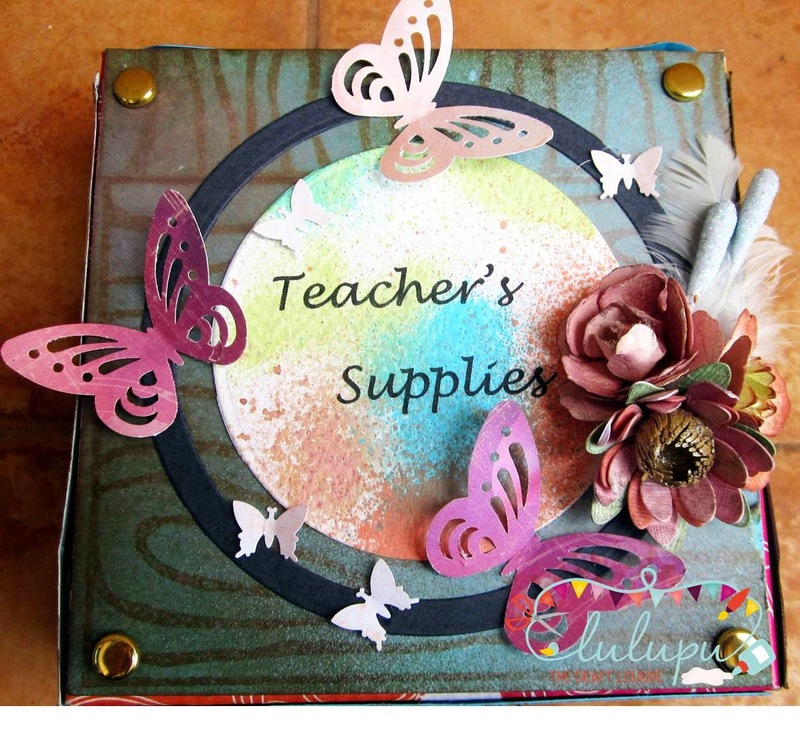 I also used Prima Sugar dots and butterflies. Waiting to see what you come up with our this challenge theme. You will have to use Background stamp and Ink sprays in your creation to get qualified for the prize. Please mention which are the products you have used.